Current and former PTDT dancers! 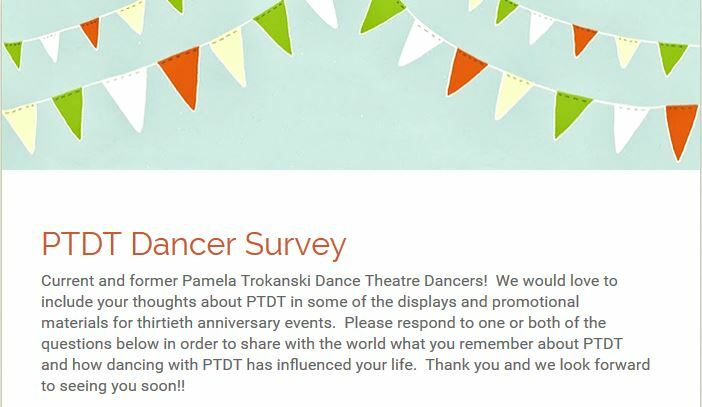 As a part of the 30th Anniversary events, we would like to invite you to fill out a survey about your experience as a PTDT dancer. It’s short – just a couple of questions. Mainly, we want to know (1) How did/does dancing in PTDT impact your life? and (2) Is there a particular dance that stands out in your memory? How will we use your answers? The PTDT Board of Directors will post your comments on a wall of memories at the upcoming Movie Night and for an upcoming fundraising campaign. We need your responses by the end of February, so please take a moment now to fill it out.